You must make reservations at least 5 minutes in advance of the time at Perrine. A parking garage is located one block from the hotel. Subway line NWR at 59th Street and 5th Avenue. 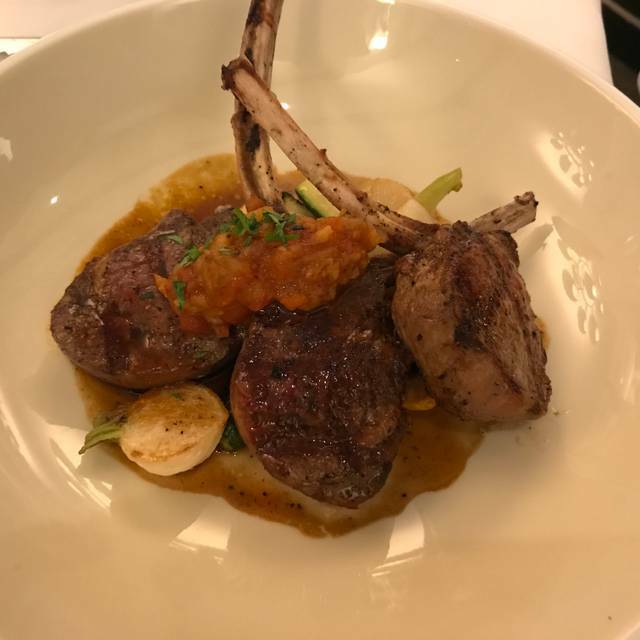 Perrine, The Pierre Hotel's New American restaurant, offers a menu of seasonally-inspired fare along with daily specials that feature updated takes on vintage Pierre classics. Executive Chef Ashfer Biju’s simple, yet elegantly orchestrated dishes are enhanced by vibrant ingredients and harmonious flavor pairings, from expertly prepared meat and seafood entrées to refreshing raw bar selections and colorfully composed vegetable dishes. The whimsical desserts are a wink to The Pierre’s indulgent personality, extending a taste of luxury to hotel guests and locals alike. Grabbing a bite in Midtown? Ask about our new Central Park Lunch Break, starting at $29! Best place to dine in Upper East Side. Chefs and service is so personable. They make you feel at home and always offer to make things off the menu. Love perrine. Best place to dine on Upper East Side. Excellent menu with even better service. Waiters are eager to offer off menu items. Chefs always send their compliments to the table by offering additional food. In short a class apart. If I could, then I would dine here every day. What a lovely experience to eat at Perrine. The food was delicious, service was lovely and we were so happy to spend time with my cousin visiting from Texas. The decor was beautiful and we learned that Richard Nixon used to work out of the hotel Pierre before he officially moved to DC as President. Very nice, elegant , only complaint, had a regular champagne mimosa, second glass waiter offered glass of champagne, I ageeed , but one glass was $25, Not ok, without saying price. Louis was amazing. Lovely gentleman. He made the evening. Thank you Louis! 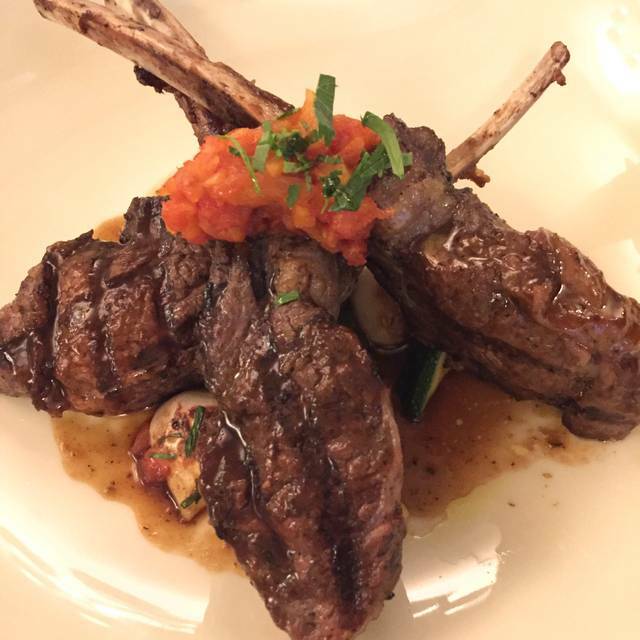 Massimo and Co. were charming and very hospitable, providing elegant and unobtrusive service. Good Bellinis to start and the most delicious tarte with mushrooms and a fig embellished salad. Husband had the dairy free squash soup (comforting and delicious). Our Masala omelettes were very tasty but I missed having some type of cheese or sauce in them (a bit dry). Scrumptious Apple tarte tatin. Not shareable portion which I liked. I still don’t understand this messy gargantuan desserts were everyone digs a fork. Will definitely return next time in the area. Wonderful food, incredible service, we were never left waiting and had a great time. Perrine did exceed my expectations. It was alright. One visit is enough for me. Great Indian Curry and Beef Wellington. 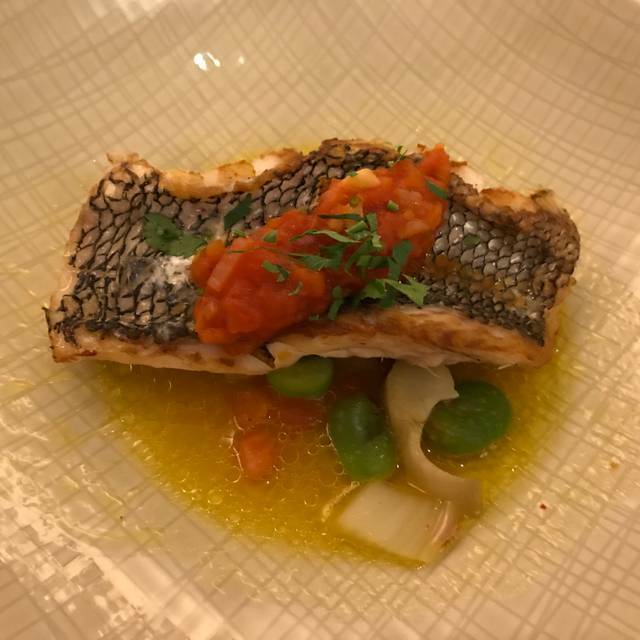 Interesting mix of Indian and upscale European food. Excellent Evening, service was great. It's very sophisticated. Uh. Perfect. Also I'm very picky. If you are dumb and noisy like most visitors in the city, you won't enjoy this quiet civilized experience. It will confuse you why people choose to spend money in a quiet place where people can share conversation without 18 speakers blaring techno or rap and other people loudly saying "like" every 3 words. Go to (and stay at) times sq. It will make you and the diners at this place happy. It is very delicious foods and excellent service. It is valuable to try it. Food was delicious (especially the roasted butternut squash soup and branzino) but portions were small for the price. Wait staff and hostess service were very pleasant and attentive but kitchen seemed slow given how uncrowded the restaurant was. It was our wedding anniversary and I emailed them to ask if we can have something speciale etc.. I saw they menù that they sent me by email, but they never have us champagne sorbet, I also asked them I think you guys forgot to serve us champagne sorbet.. and they said oh I’m really sorry we gonna bring you now but they never gave us and they just bring us final check..
Will never suggest to anyone to go there! 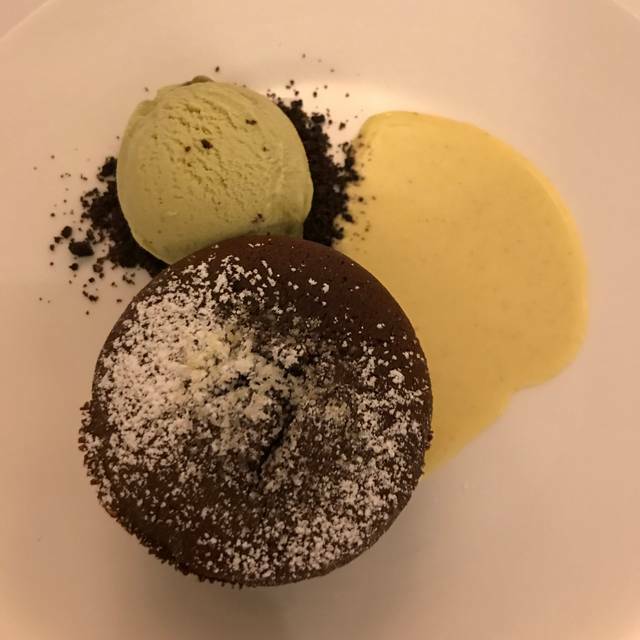 great food- wonderful atmosphere- restaurant week menu excellent. will be back. Service is kind and attentive but very slow. Food was very good! The food and waiter service were very good. However there was a long wait between the time we finished the entree and being served dessert. No one was at the host station at the entrance so we were not greeted, offered the chance to check our coats or readily shown to our table. We had to fend for ourselves and find someone to help us. Decent food; quite poor service; very noisy. Wonderful food and great ambiance. Staff was kind and attentive. Thank you!!! We look forward to seeing you again really soon!!! We loved the food and atmosphere. Quite restaurant .. we could enjoy our talk. Great meal. This was my second visit and the food was as good as last time. Its a nice place. Would definitely go again. Great place for brunch with family. Best Bloody Mary I’ve had in nyc! The service was the worst we have had in a long time. We waited 5+ minutes at the hostess stand to have our coats checked and to be seated. It took 20+ to get water on the table and we hadn’t seen menus by 30-40 minutes of sitting down. Multiple drinks were ordered and then never delivered until asking multiple times. The pasta was lukewarm. We had to continually ask for our waters to be refilled. The waiters kept interrupting each other and then they both would wander off. We waited another 10+ waiting to get our coats to leave. For such a lovely fancy hotel, the food was just ok. The server didn’t pay enough mind, served red wine in white wine glasses, didn’t pick up plates for long, and even fussed about the bill and literally counted the cash spread out on the table. At 10:30 on a Friday, they started cleaning up around us and making big noises, turned the lights up, got our coats and put them on the table next to us. For the money, glad we came for restaurant week else def not worth the money- so many amazing places in the city! Thank god we ordered good wine which also we selected ourselves with no help offered. They better improve their act!! We had noon reservation was the 2nd party to arrive. 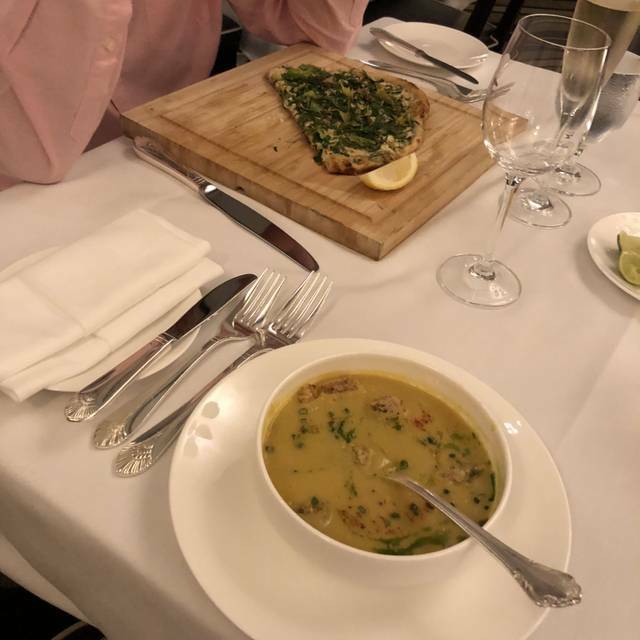 My kale Caesar salad was crisp and fresh, salmon skin was the texture of chips and meat was juicy and tender, flan was delicious, with a slice of sundried orange to go with orange flavored ice cream. I had time for coffee and it was served very hot, with coffee served in a silver pot for refill. Even milk was served warm. My partner had earl grey, which was served in a glass pot, with tea leaves inside a stainless steel catcher to allow tea leaves to simmer. Attention to details was throrough and was very much appreciated. We had a great time. I recommend it. I liked the place and ambience but not as much as the food. 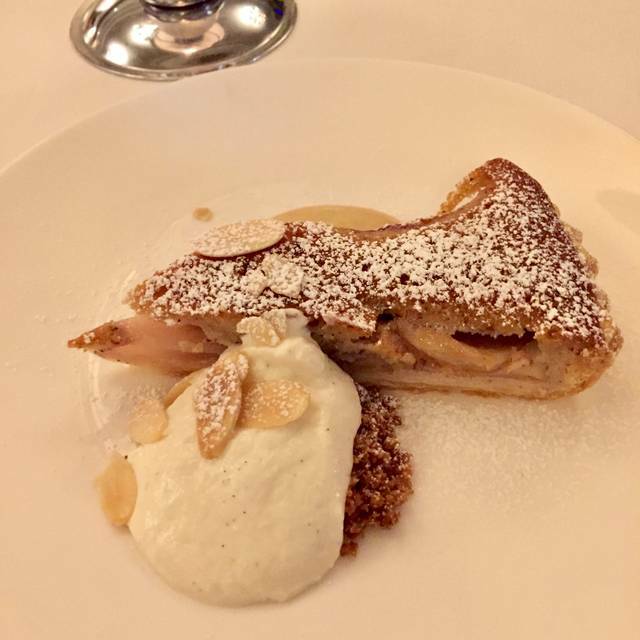 Especially my dessert Apple Tarte which was tough to cut and chewy to eat. The lobster salad and salmon are not as tasty as i expected. But Staff were friendly and provided good service. Very pleasant dining environment - the lobby is fabulous and the dining room is comfy and clean. The food was awesome! 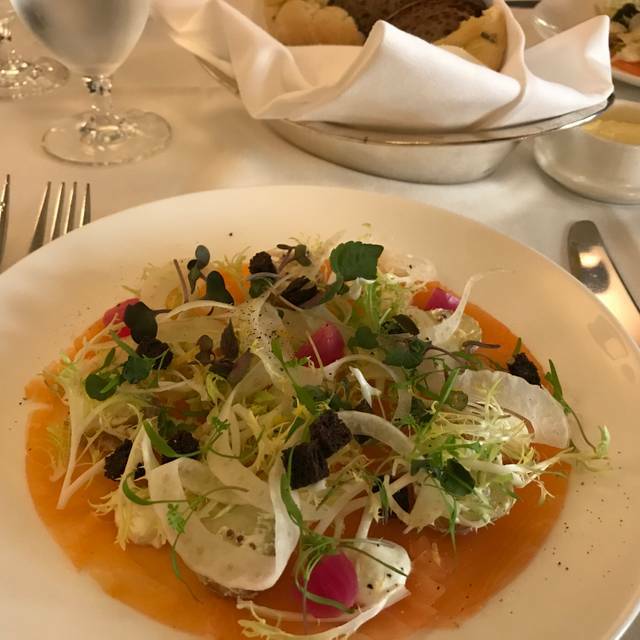 We went during restaurant week and tried two course - the winter citrus salad included fresh oranges and feta cheese; the main course roasted salmon was juicy and flavorful; the cauliflower puree and lentils that went along with the salmon were perfectly done! The staff was enthusiastic and professional as well! Great menu for restaurant week, service was ok. Felt like we kept having to ask to refill our drinks. Restaurant week service was slow and portions were a little smaller. 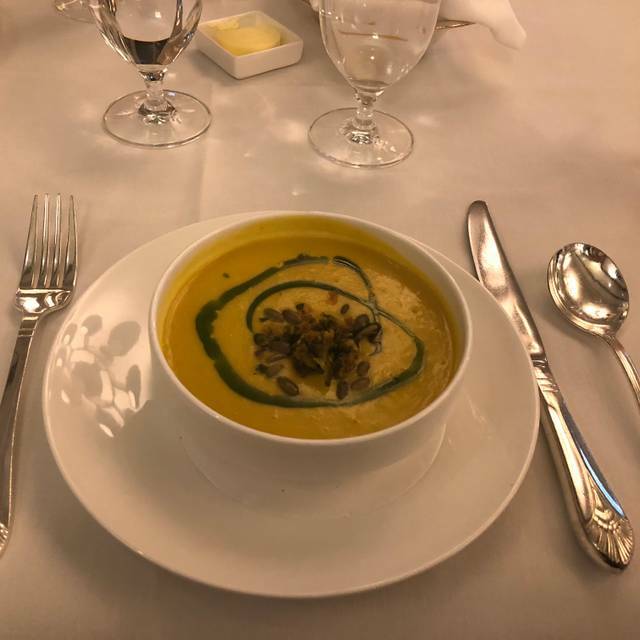 I have a three courses lunch on January 25, 2019, gorgeous environment, the food quality beats my expectation, especially the desert Meyer Lemon Flan and the appertizer wild mushroom bisque. The server is very friendly, I couldn't see the menu clearly, the server helps me out by bringing a pair of glasses. Love this place. Visit during restaurant week. Ordered branzino and beef short ribs. Both were very good. Julio the waiter was very good and entertaining. The food was delicious and the staff was very knowledgeable...especially about the wine. Kitchen is quite good but service does not do it justice. Far too few servers and waiters and a non existent host. The staff needs more training. We were never offered regular menu during restaurant weeks. Ordered wine before seeing that there were specials on restaurant week menu. Waiter needed to return twice to confirm cocktail order. An elegant dining experience. Food and service were excellent. My wife and I had a chance to enjoy each others' company without being rushed. 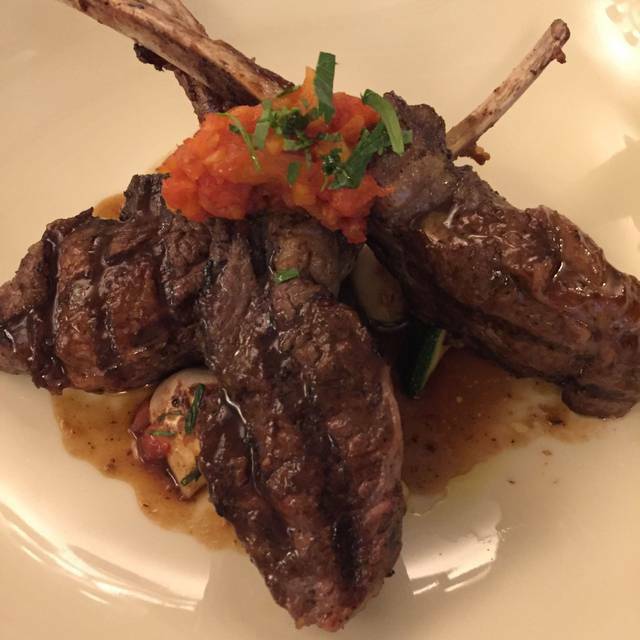 My wife chose the fish from the Restaurant Week menu, I chose the lamb chops. There was a $12 up-charge for the chops but it was worth every penny. Perfectly prepared medium rare with a sauce that was a perfect match. For the appetizer I had the best onion soup ever. My wife had the squash soup (I didn't care for it) but she raved about it. We both had the apple tart. My wife thought the bottom crust was hard to cut - I loved it. Looking forward to our next visit. The restaurant was nearly empty but we were seated in Siberia. Don’t know why?